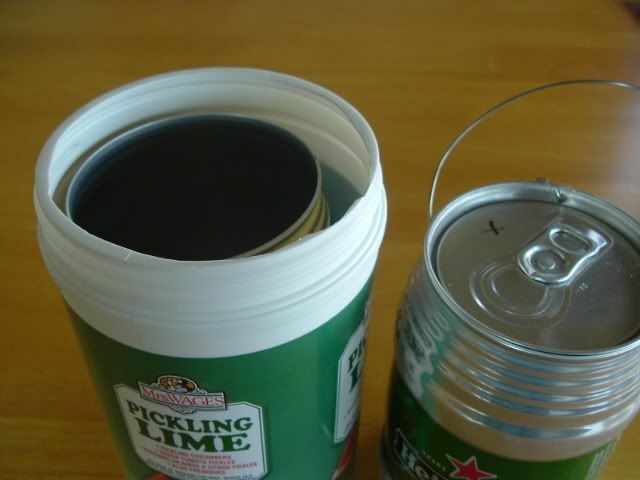 I thought it would be a good idea to have everyone post what kind of containers are being used for carrying a heineken pot set up to keep the pot from getting squished. 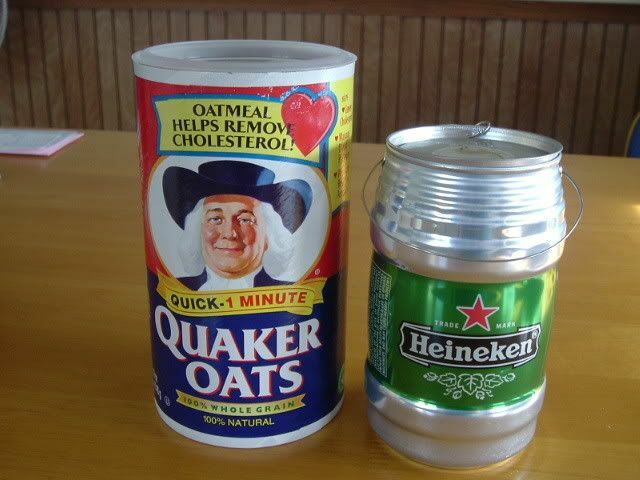 For starters is the Quaker oats Oatmeal container. Also saw a clear plastic container used for stick pretzels in a grocery store on the east coast when I was on vacation this year. Don't remember the store name. 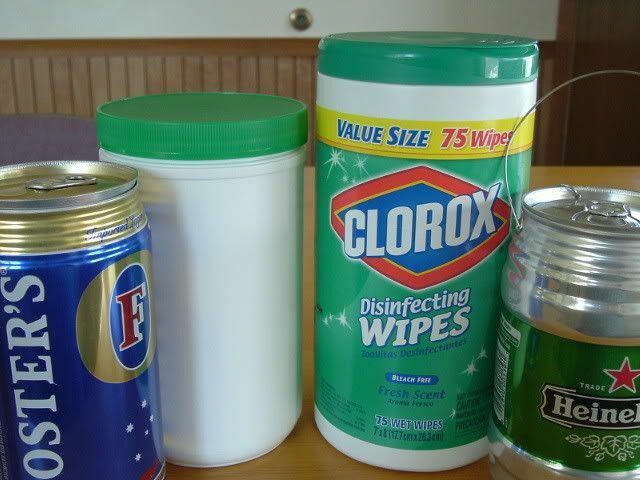 I think i post this once this set has two pots all into the big can. I got this at wal mart 3 to a set its called lock & lock storage conatiner this size is a 7.6 cup size 61 oz. 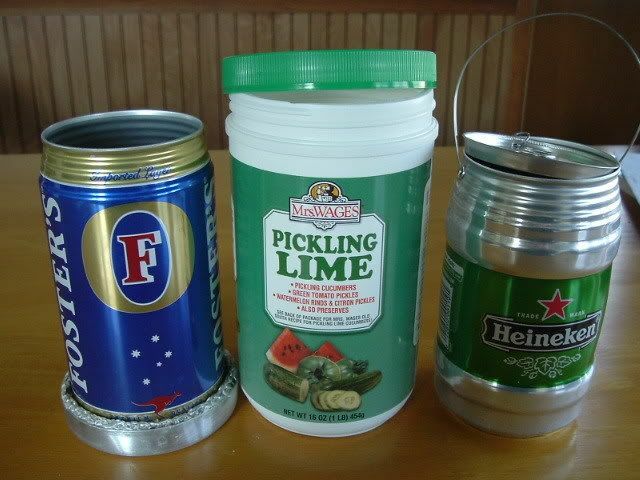 1.9 ot..
That pickling lime container looks like a good fit. How expensive is that stuff? Hard to find? I say we start a "Pimp My Heine" thread for all add-ons & accessories for Heine cans. 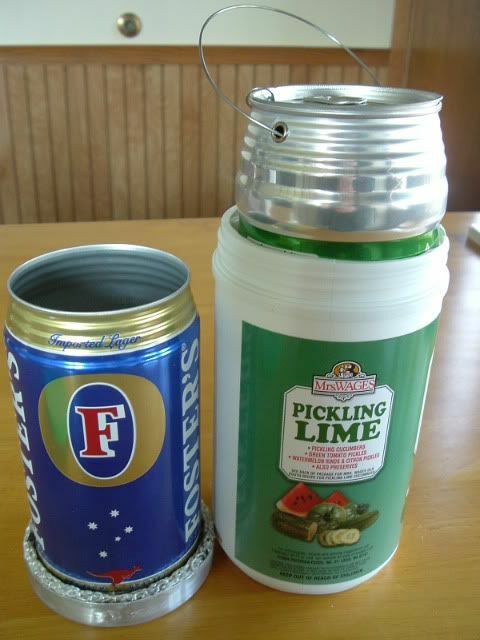 CajunHiker wrote: That pickling lime container looks like a good fit. How expensive is that stuff? Hard to find? It was purchased at a local "Ace" hardware store for less than $4.00. They also have pickling salt(no additives, like iodine) in the same size container. The salt can be used as regular salt. Let's try your idea Cajunhiker and rename this thread. What say you? Recently found this milk bottle to be of the right diameter to fit inside the Heiny can. 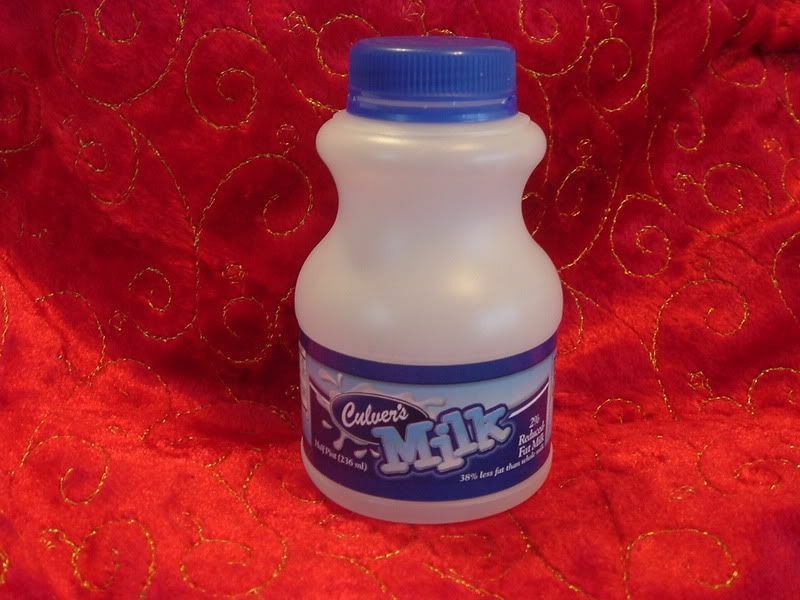 Purchased at a "Culvers" restaurant here in the midwest. 1/2 pint liquid capacity. Put some dark food coloring in your fuel to make it visible through the plastic. I have been using Skids idea of the Zip-Loc containers with the screw on tops. I just can't decide if I want to make a coffee filter out of the top or use it as a cup or bowl If I drilled a hole in the top bowl for a coffee filter. I wonder how practical it would be to use a small rubber stopper to use it as a cup or bowl for oatmeal, when not using it for a coffee filter ? How many people attach a wrap to their Heine pot to grab it without burning their fingers or do you just use a rag. Ridgerunner wrote: I have been using Skids idea of the Zip-Loc containers with the screw on tops. I just can't decide if I want to make a coffee filter out of the top or use it as a cup or bowl If I drilled a hole in the top bowl for a coffee filter. I wonder how practical it would be to use a small rubber stopper to use it as a cup or bowl for oatmeal, when not using it for a coffee filter ? Haven't tried the rubber stopper idea(considered it though), but remember the zip loc bowls are stackable so you could just stack one more on top with little space penalty. As to lifting the pot, I still swear by(and seldom at)wool gloves, which I carry regardless. I had a modified tunafish can lid that I had made into a lid for my heini pot but gave it up when I saw someone using an Altoids citrus sours lid for the pot cover, seems to fit almost perfect just slightly loose there is a 1mm gap all the way around the pot. I'm not sure if I can tweak this some how to get it a little more snug. A pipe expander might work but I don't own one so....Anyway I put my silicone wristband around the top of the altoids lid and tadah. The silicone band hangs down about 2mm and it seams to form a more snug seal around the top. I will be looking for a small knob to put a handle on it but I am in no hurry as it seems to work ok this way. Don't use a wrap, mainly because I'm cheap! Use the bandanna, mainly because I'm cheap! 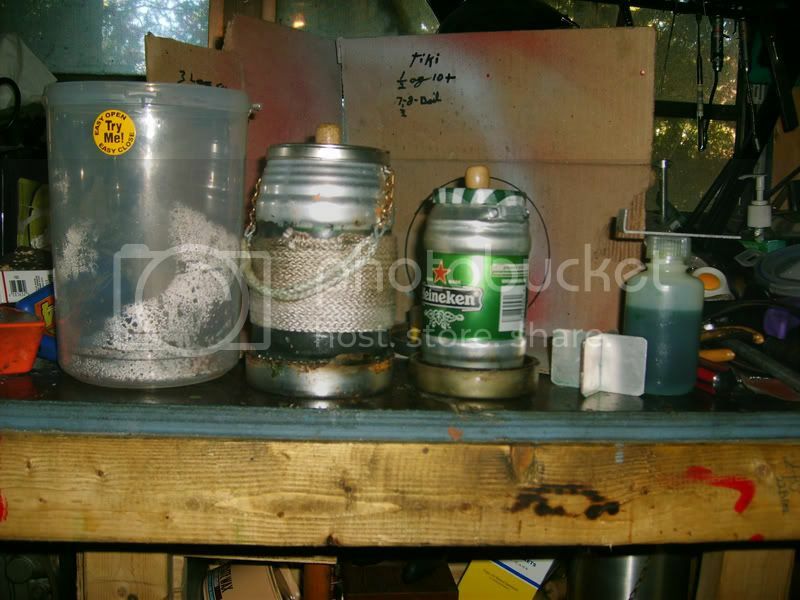 Although the fiberglass wick wrapped around the can looks very very interesting. But I probably won't do it unless the stuff falls out of the sky at me, mainly because I'm cheap! My first post here and I have to say what a GREAT site this is! I've been looking for a sit like this for some time now. Just got into making stoves and I've got just about everyone convinced that I'm crazy! I'm still experimenting, but now that I've found you (this site), I'll probably have a lot more options. One question I have:......How do I side cut the top off a Heini? I bought a side cutting can opener, but because the sides of the Heini aren't straight, I can't seem to get the can opener on. If I force it, I'll make a HUGE dent towards the top of the can and it just ends up popping off. I bought the Good Hands can opener and then bought another, but have the same problem with the sides of the can being tapered. Is there a cutter that just comes over the edge and doesn't hang down?